The advertisement from the back page of the Belfast News Letter ofJanuary 20 1739, bottom right, is hard to read due to the great age of the paper. It is from the fifth surviving News Letter, dated January 9 1738 (which is in fact equivalent to January 20 1739 in the modern calendar). The paper was founded the year before, in 1737, but the first year's editions are all lost. 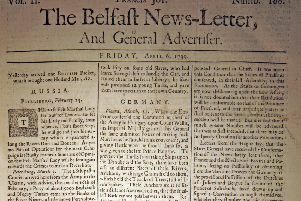 In the ‘Reported This Week 280 Years Ago’ (January 19) column, the excerpt on a found bull says that the original report in the 1739 News Letter is hard to read due to the age of the paper, and concludes that the location might be Straid. This is correct. Hercules Clements owned the lands around Straid, near Ballyclare, Co Antrim in 1738/9. The family died out in 1749 and lands fell to the Crymble and Ellis Families. In 1847 the last Ellis, Jane, sold it to the Marquis of Downshire. The Clements mansion, at Clements Hill, at the top of the Green Road, Ballyclare, has long disappeared but the name lives on. Mark Twain of Tom Sawyer fame, Samuel Langhorne Clemen (t)s was a descendant of this family. Keep writing your 18th century snippets. We are really enjoying them.